Why Is Mahama Eager To Comeback With All The Past Corruption Records And Gross Economic Mismanagement ? 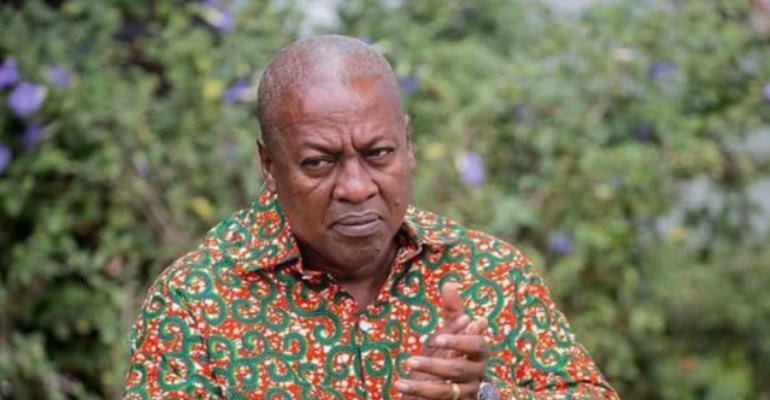 The predicaments of the opposition NDC are getting out of hands, particularly with the election of former president John Dramani Mahama as the party's flagbearer aboard 2020 presidential elections. It is a fundamental principle in life, to note that you cannot eat your pie and still have it. Absolutely impossible! Indubitably, the highest office of the land in our jurisdiction is the presidency, and under no concrete moment should it be lowered as an office for the correction of 'errors' orchestrated by the same person who wants to correct them. Never trust a person again provided he betrayed and ridiculed the trust you reposed in him in the past. Given the very harsh socio-economic standards of living under the erstwhile president Mahama's administration, I am least surprised with the general skepticism, disgust and anger arousing over the decision of the former president, who disgracefully led the NDC party to a historic defeat, to lead the party once again in the 2020 general election. On his decision to run for the presidency once again, the former president said, "I've prayed diligently about the task ahead and I believe I owe a duty to God and my country to take our great party back into government, to write the wrongs of the past and to put an end to the cries of the people under the current dispensation". Did I hear the former president say 'to write the wrongs of the past'? This is very unfortunate coming from the man who seriously needs power again to enrich himself and family as did before. Undoubtedly, never before had Ghana witnessed so much corruption, looting, gross incompetence and abysmal socio-economic performance by an elected president as it happened in the erstwhile former president Mahama's administration. His credentials and readiness to serve this country with the seriousness it deserves has dwindled permanently. It is therefore in the right direction when a leading member of the NDC, a former member of Parliament and an aspirant for the party's flagbearer position, Sylvester Mensah said, "the presidency is not a place where you go and make mistakes, come back and ask to be given another chance to amend your mistakes. I think that, you must be ready and prepared to get to the seat of the presidency, and when you are there, there should be minimum errors but if you go there and commit errors and just come back to the public and say that, I made mistakes, I am now coming back to correct my wrongs, it simply means you were not prepared then and even now Mahama is not prepared". Presidency is about applying your level of experience to improve your country nurtured through one's wisdom but former president Mahama seems to lack such characteristics needed to grow our country. You might think persons seeking to lead the highest office of the land will come in to convince electorates with the good they did in the past, but to tell them to give you another opportunity to go back and correct your wrongs is mind boggling and deceptive and this has been the current case which leaves much to be desired from them(NDC). And it is definitely what happens when one has no cumulative evidence of track records of progress, growth and development in the past. It will be a great service to God and country if the former president can elucidate on some of the wrongs he did that he wants to correct. Is it the bloating of contracts or the dead goat syndrome attitude; is it the longest dumsor that bedeviled this nation or the comatose NHIS with colossal arrears; is it the skyrocketing interest rates or the cancellation of nurses and teacher trainee allowances; is it the restoration of SADA mess or taking oil rich country like Ghana into the IMF in 2017 or is it the Free SHS that he said is impossible? Maybe, the meatless born he left has seen some improvements under the selfless and determined government so he sees the need to come again and create, loot and share as he did before. It is still very evident the former president Mahama is bereaved of ideas to progress this country. He is excellent at ways of ensuring retrogression in all facets of our socio-economic matters. Without any shred of doubt, I am more convinced, like many Ghanaians are, that, the former president, Mahama is in to cause more grievous harm, which thankfully have been resolved and worked at by the best president, H.E Nana Addo Dankwa Akuffo-Addo and his administration. I am still waiting for a single objective reason from the former president that suffice why he wants to be president again, it is obvious he is hungry for power.